The Relentless Reader: Readathon! Readathon! READATHON! It's time for the April 2015 edition of Dewey's 24 Hour Readathon! As you can see by the dancing I'm incredibly excited. This is my landing page but I'll be most active on Twitter and on Instagram. I hope you'll hang out with me there! You'll also see me out and about cheering on my fellow readers as part of the #TeamFrodo cheer squad. Have a great day of reading, everyone! I'm coming at you from the beautiful, though chilly, state of Wisconsin. I'm very much looking forward to reading And Tango Makes Three. There's a french toast bake in the oven right now and it smells heavenly! Honestly though, if you follow me on Instagram you know all you need to know. I've got a husband, I've got some kids, and I've got some cats. I work at a bookstore, I read a lot of books, and I talk about books all the time. That's me. 5) If you participated in the last readathon, what’s one thing you’ll do different today? If this is your first readathon, what are you most looking forward to? This is my 100th readathon. Nah, I can't remember how many I've done. One thing that will be different is that my daughter is going to readathon with me for the first time! I'm incredibly happy to hang out and read with her today. Now, go forth and read! I wish I could talk someone from my family into joining me! So I found Biscoff - but I haven't allowed myself to open it yet. I'm afraid I might have had it for breakfast. Good luck! Happy to see you here! Hope you have a fabulous Readathon! Have a great reading day! French toast bake sounds awesome. I should have planned better food—all I have is a boring bagel. Happy readathon day. Best of luck with all of your goals. I hope you and your daughter have so much fun today! Ooh, french toast bake sounds amazing! Happy reading! It's awesome that your daughter is reading with you today!! Hope you guys have a TON of fun! Hope you're having a great Readathon! I was able to talk my husband into reading with me for a few hours tonight. It's a lot of fun to have a family member read-a-thoning with you. Enjoy the rest of your reading! I only heard about this when is started through a blogging friend of mine - but I am cheering and will join next time it comes around! And you make delicious food! That totally needs to go in 4! 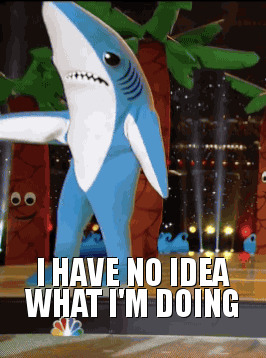 Also I love the left shark.